Raymond Bial’s book, A Handful of Dirt, is photographic essay about soil. Written for children ages 7-10, it covers the important and formation of soil as well as the many organism that dwell within it. The author’s reverence for soil comes through the entire text whether he is talking about the rocks that provide the inorganic minerals of soil or the plants and animals that create the organic components. A considerable part of the book is devoted to the organism that live in the soil from microscopic protozoa’s, nematodes, and bacteria to earthworms, moles, prairie dogs. Bial emphasizes the interaction between organisms, and the role they play in building up the soil. He points out that people can enrich the soil by applying homemade compost and give simple directions for making and maintaining a compost pile. As a final point he reminds readers that although soil is constantly being made it is also constantly lost to both natural forces and asphalt or cement as cities grow. The book is illustrated with photographs taken by the author. Every picture has a caption that gives factual material that supplements the text. Too bad the captions are so small! Some of the photographs were taken with a microscope or electron microscope giving readers a very close and detailed look at organisms not usually seen in a children’s book. An excellent resource for teaching children about the unique characteristics and importance of dirt. 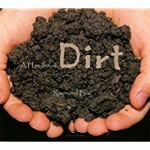 To buy A Handful of Dirt from Amazon.com Click Here.